Daniel Cozort's extraordinary book clearly outlines and discusses the methods for transforming both body and mind through the highest forms of tantric practice. 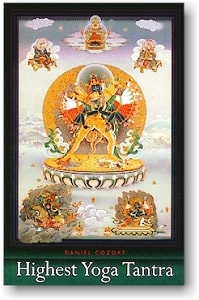 Part One discusses the practices common to sutra and tantra. Part Two presents the generation stage of highest yoga tantra. Part Three covers the entirety of the completion stage yogas (i.e., physical isolation, verbal isolation, mental isolation, illusory body, clear light, and union). And Part Four compares the Kalachakra and Guhyasamaja stages of completion. Remarkable for its definitive clarity, this exposition of the stages of highest yoga tantra is the first of its kind in the English language. Paperback, 2005 edition, 195 pages.